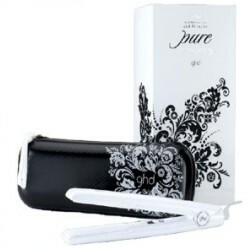 The latest straightener from GHD, the GHD Pure is a high gloss all white hair straightener. This limited edition Pure Styler comes with a free ghd case to protect your new GHD straighteners. This new release from GHD asks the question Dark or Pure, which one are you? For the mysterious and seductive there is the all black GHD Dark and for the honest and innocent the all white GHD Pure. Check availability and best price of the GHD Pure below.